People with Down syndrome (DS) suffer from marked muscle weakness. Simple tasks of independent living, such as getting out of a chair or climbing a flight of stairs, can become major obstacles. This can reduce the quality of life for those with DS and lead to a loss of independence. Now, a new study sheds light on some of the suspected causes of muscle weakness.Led by scientists from Syracuse University, a research team has investigated muscle weakness in a mouse model of DS. "If we understand the cause of this muscle weakness, we can begin to look at potential therapies for treating it," said Patrick M. Cowley, lead researcher. The investigators analyzed the soleus muscle—a muscle in the lower leg—and looked into whether the weakness was due to a deficiency of the muscle itself, independent of its activation by the nervous system. "Surprisingly, we found that the strength of the muscle itself was the same between the DS and control mice—suggesting that factors in the nervous system may play a more dominant role in explaining muscle weakness in DS," said Cowley. The article is entitled "Functional and Biochemical Characterization of the Soleus Muscle in Down Syndrome Mice: Insight into the Muscle Dysfunction Seen in the Human Condition". It appears in the online edition of the American Journal of Physiology – Regulatory, Integrative and Comparative Physiology published by the American Physiological Society (APS). The researchers removed soleus muscles from 14 DS mice and 16 controls. They tested the muscles for strength, fatigue and recovery. They also assessed the distribution of fiber types in muscles from both groups. 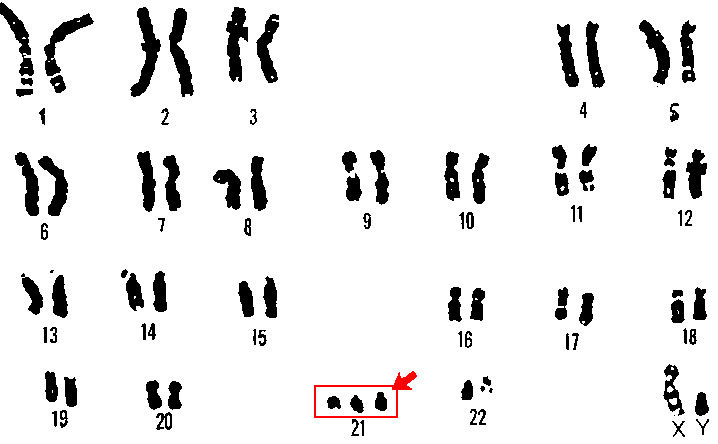 Because there are three copies instead of two of chromosome 21 in persons with DS, the researchers looked at whether the additional genes caused over-expression of proteins that could then lead to oxidative stress. They also looked for well-known markers of oxidative injury. A cell-level deficiency in processing of oxygen might also explain the muscle weakness. To determine if this was the case, the researchers tested for the level of two markers for oxidative capacity in the mitochondria, where oxygen metabolism takes place in cells. Finally, the researchers used microarray analysis to investigate the gene expression and molecular pathways in the muscles of DS mice. Results There were no significant differences in the force production of the muscles between the two groups. This finding means that muscle weakness in DS was not due to inherent differences in muscle force generating capacity. Fatigability of the muscle from DS mice was not different from the controls. It did, however, show impaired recovery. There were no significant differences in muscle fiber types between the groups. While one marker of the cells' ability to process oxygen was lower in DS mice, the other was similar in both groups, meaning that there was not a clear indication of mitochondrial limitation that could explain muscle weakness in DS. Finally, the researchers found that SOD1, an important antioxidant, was overexpressed in DS mice. This was not a surprise because the gene for SOD1 is tripled in DS. However, there was no increase in markers of oxidative injury, suggesting that this over-expression did not led to oxidative stress in DS muscle. There were numerous altered pathways in DS muscle revealed by microarray analysis including the breakdown of proteins, metabolism of glucose and fat, and neuromuscular transmission. Importance of the Findings This study shows the importance of better understanding muscle weakness in DS. Interestingly, the study found that the weakness was not due to a deficiency in the muscle itself. This may indicate that neural activation of the muscle plays a greater role in explaining weakness in persons with DS. "We now know that the muscle is not the major issue responsible for muscle weakness in DS mice," explained Cowley. "We need to look at the neural factors involved—from the motor systems in the brain to the neuromuscular junction—to determine the cause of muscular weakness in people with Down syndrome."